Venezuela's security forces look for smugglers near the Tachira river in San Antonio on Monday. (CNN) -- The Colombian government said it would appeal to international bodies over what it called a threat made over the weekend by Venezuelan President Hugo Chavez. On his weekly Sunday television show, Chavez ordered the Venezuelan military to begin preparations for a war with the neighboring country, warning of a conspiracy between Colombia and the United States to attack Venezuela. "The two governments have joined together to fool the world or to try to fool the world," Chavez said. Addressing his military commanders, he added, "Let's not waste a single day in the preparation of our main mission: to prepare ourselves for war and to help the people prepare for war. It's everyone's responsibility." On Sunday Colombia's government responded, saying it has not undertaken any hostile actions toward Venezuela. Colombia said it would ask for intervention from the United Nations Security Council and the Organization of American States. A Colombian government spokesman, Cesar Mauricio Velasquez, called Chavez's remarks "war threats." On Monday Venezuela retorted by calling Colombia's response "hypocritical" and "immoral." Chavez's accusations of threats from Colombia and the United States come from an agreement between the two countries that allows U.S. military personnel to be stationed at seven Colombian military bases. The Venezuelan leader is the leading critic of the agreement and has said that the agreement is part of a plot to destabilize his leftist government. "Don't be mistaken, Mr. Obama, and order an overt aggression against Venezuela using Colombia," Chavez said Sunday, in a reference to U.S. President Barack Obama. "Don't make that mistake, because we are willing to do whatever it takes. Venezuela will never again be a colony." On Monday the U.S. State Department said it supported talks to defuse the conflict. "We support Colombia's call for dialogue between Venezuela and Colombia to overcome recent tensions in the relationship," a State Department spokesman told CNN en Español. "As a member of the hemispheric community, we are prepared to work collaboratively to promote peaceful solutions to disputes in the region." Relations between Colombia and Venezuela have been rocky since the summer. In August, Colombia accused Venezuela of supplying guerillas with shoulder-fired anti-tank weapons. Such weapons seized from the Revolutionary Armed Forces of Colombia, or FARC, had been traced to Venezuela, Colombia said. The FARC has been fighting the Colombian government for more than 45 years. Chavez, at the time, said the accusation amounted to blackmail. Last month Venezuelan authorities said they captured two Colombian spies. Colombia denied the claim. Also in October, near the border between the two countries, Venezuelan authorities found the murdered bodies of 10 men that Colombia described as an amateur soccer team that had been kidnapped near the border. Venezuela said the men were paramilitaries. 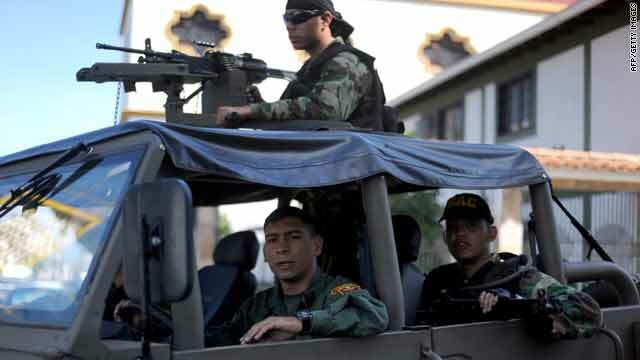 Tensions were last stoked a week ago when two Venezuelan national guardsmen at an international bridge between the two countries were killed by gunmen on motorcycles. Venezuela blamed Colombian paramilitaries for the attacks, and accused the Colombian government of complacency toward such groups.